Our outlook and work demonstrate a preoccupation with translating lost methods of making into contemporary culture and practice. Helix is a product of an ongoing research agenda that centers on volume as an area of architectural exploration. 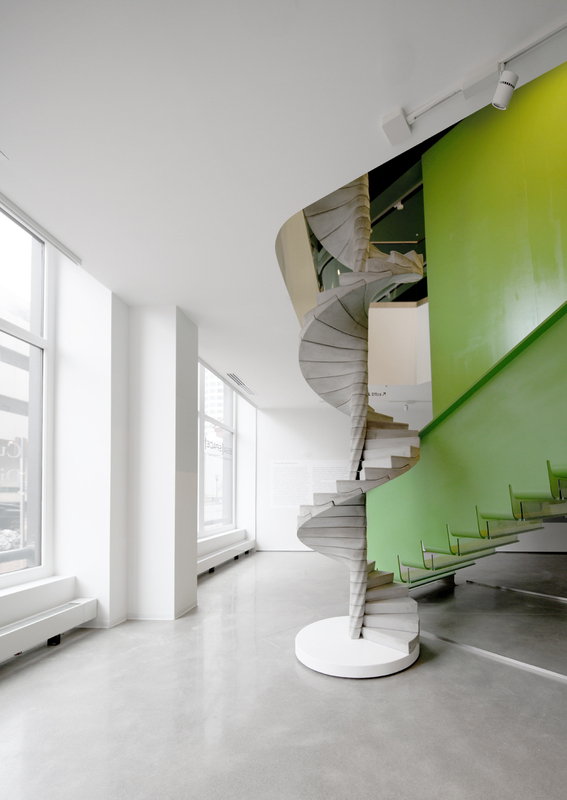 Helix is a half-scale spiral stair. While this reduced size resolves a number of practical concerns—weight, liability, access—the piece celebrates its impracticality. It is both column and stair, yet hangs from the ceiling. Its uncertainty and changed scale inject playful characteristics into the surrounding space, while maintaining an allegiance to the past and the known. A second preoccupation of ours is what we term ‘plastic rhetoric.’ The solid, heavy, and volumetric action of casting concrete transforms a liquid matter into a solid mass that wants to crack. The stair’s plastic and curvaceous treads reflect the materials earlier liquid state. Its twisting accelerates as it wraps around the support column, appearing to re-plasticize the figure. The entire constructs organic and malleable appearance is counterintuitive in light of the zero-tolerance system of nesting and keying from unit to unit. Spirals are ubiquitous across cultures and times. Helix is our spiral. 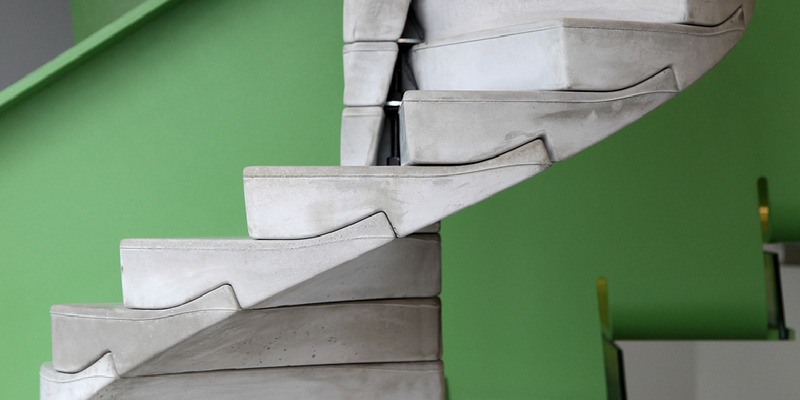 The stair is produced with precast unreinforced concrete. These treads are unreinforced to test some claims as the team move closer and closer to stone as a testing material. Unreinforced concrete has little to no tensile capacity making this project a structural prototype in collaboration with Matthew Johnson of Simpson Gumpertz & Heger. Each tread is cast in a fully encapsulated custom mold. These molds are rubber with a solid wood mother-mold to clamp the assembly together. The molds are vibrated rigorously during the pouring process and then immediately steamed for twelve hours to cure. The entire stair assembly hangs from a beam two stories tall. This beam then drops down a threaded rod to a base that serves as a pendulum balance. Each tread is designed to hook over this threaded rod and be bolted down to its neighbor below. The geometry of these treads lock into each other with a series of three-dimensional keys that reduce any shear or slipping between units. Typically a stone spiral stair is held from the perimeter. In this case, the stair is compressed in the column to ensure stability. Further Information on Helix can be found in our publication 'Range'.